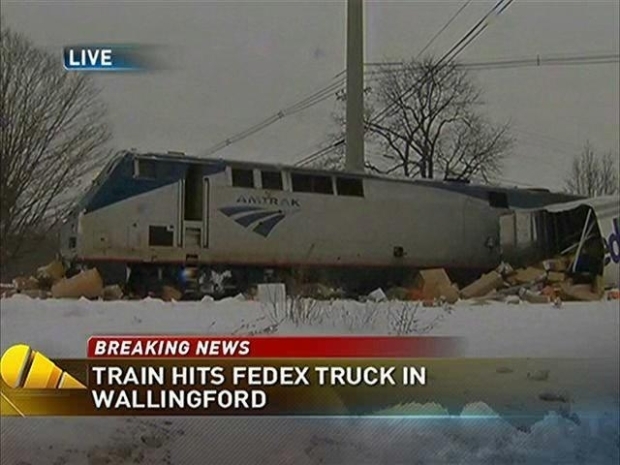 A FedEx driver managed to get out of the truck just before it was struck by an Amtrak train on Tuesday morning. The FedEx truck was stuck on the tracks near a FedEx facility on Toelles Road in Wallingford because of slippery road conditions and called Amtrak to let them know about the predicament, officials said. Amtrak said there was no way to stop the train, but they could slow it down a bit to lessen the impact. They did manage to slow it, but the train split the cargo portion of the truck in half just before 7:30 a.m. and spilled packages onto the roadway. Luckily, no one was hurt, officials said. The train is carrying 98 passengers from Springfield, Massachusetts to Washington, DC. Emergency crews are checking the train to see if it can continue along its path.